As I browsed through my Mailbox magazine, I found a great idea to help the children with the color yellow. It was also appropriate as we have been singing "The Wheels on the Bus" alot because of the beginning of school. I found the "recipe" in my Aug./Sept 2002 edition of The Mailbox for kindergarten. At circle time I put the vanilla icing into a transparent glass bowl, then I added yellow food coloring and stirred. 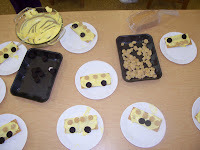 This way the children could watch the white icing turn yellow. Then each child got a graham cracker on a paper plate and a plastic knife. I put a glob of yellow icing on their graham cracker then told them they could spread it around--a lot of icing got tasted during the spreading process. 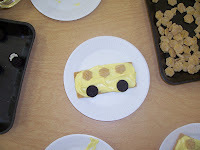 Then they got to add two cookies for the wheels, and cereal for the windows. Some of the graham crackers broke during the process too, but they didn't mind. This was an easy activity, but they had fun--even my children that are still apprehensive came right over and joined in. Now that looks like a fun & yummy activity!